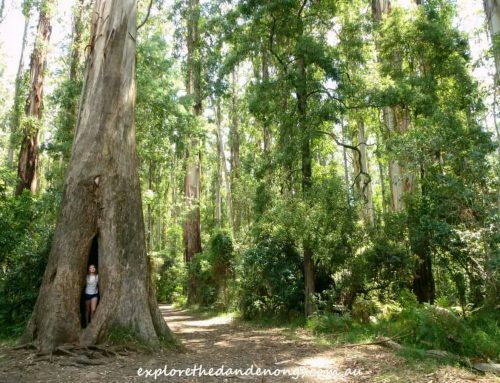 Dog-friendly walks in the Dandenong Ranges, that are also wonderful for their humans, can be found despite the fact that we are surrounded by a few thousand acres of National Park. We even have some great dog-friendly cafes. Mathias Track is possibly the best-known walking trail that allows dogs, horses and mountain bike riders. 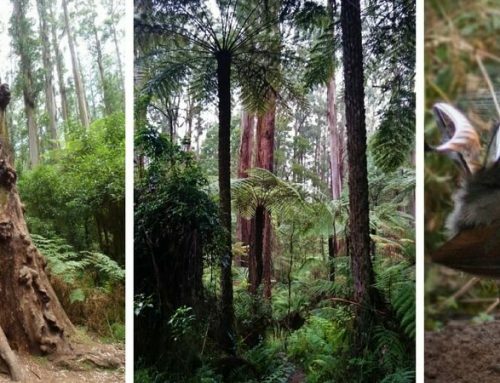 It is an 8km return walk from one end to the other and can be accessed from Falls Road, Silvan Road or the Hamer Arboretum. 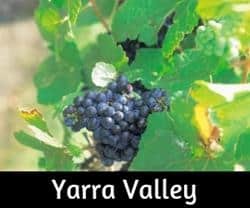 Other great tracks are Rock Track, The Hamer Arboretum and it is even possible to walk all the way from Sassafras to Emerald then onto Cockatoo! 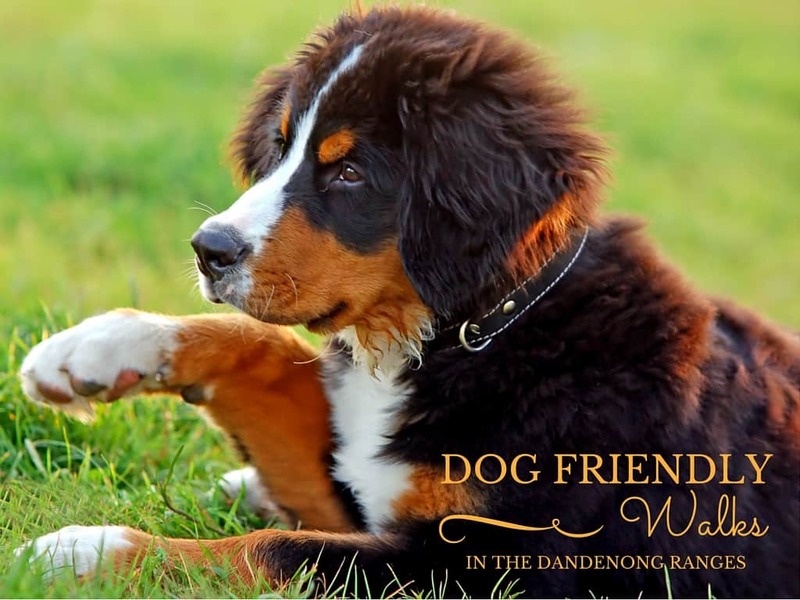 Dog-friendly accommodation is also available in the Dandenong Ranges with some of the best bed and breakfast hosts in the hills. We use a USB rechargeable flashing dog collar for walking when it’s dark. Ours has 3 settings but we always use the flashing, colour changing, funky one. It’s hilarious to watch the flashing collars in the dark when the dogs are tumbling about playing. The Olinda golf course ceased being used to play golf some years ago and is currently being used by many people for walking, with and without dogs. It is an expansive area with stunning views, pack a picnic maybe and enjoy this special spot. From the golf course, it is easy to connect with Rock Track and the Hamer Arboretum (on-lead). Another great spot for off-lead walking is in Emerald at ‘Pepis Land’ Find the location on our map. Rules and conditions can change, please let us know if any of these tracks have signage restricting access for dogs. Lilydale Lake is another good walking area. Dog walkers can follow the path around the lake, on-lead, and then let the dogs run off the leash at the far end where there is a small creek they can swim in and even an agility type course. Get Directions to the dog off-lead area. Who’d have thought we had 14 dog-friendly beaches around the bay and Mornington Peninsula? We even have a couple of horse/pony friendly beaches, one in Mordialloc! 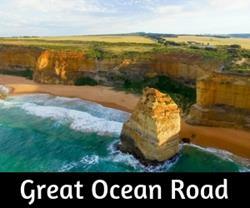 Down along the Great Ocean Road we have a few great all year round off-leash beaches for dogs too. It is possible to bring dogs to a number of accommodation places in the Dandenongs, please be sure to check the requirements of any property prior to booking. Some of our parks and gardens do allow dogs-onlead, which is wonderful. Rules can change though, so please always read regulations at the entry points before taking your dog in. Currently, the Alfred Nicholas Gardens, George Tindale and Pirianda Gardens allow well-behaved pooches in, always on lead. These two gardens are stunning in the Autumn and wonderful all year round. The Mt Dandenong Arboretum is another lovely spot too. Dogs must be muzzled and on leads to be permitted on metropolitan trains. Other small animals are permitted on the metropolitan train, tram and bus, provided that they are carried in an approved animal container. For approved animal containers, please see V/Line guidelines below. Animals other than dogs and assistance animals are not allowed to travel on public transport unless they are carried in an approved container as stated above. It is strongly advised that customers with dogs do not travel on weekdays between 7 am and 9 am and between 4 pm and 6 pm. Hi, you can add Liverpool Road Retarding Basin to the list. Its a great off lead dog park. Hi Alberto, Yes, I certainly can and had been meaning to since walking around there a few weeks ago. Thanks for the reminder. Hi Jane,have you checked with local council if the Olinda golf course is actually a registered “off lead” park? I can’t see it mentioned on their website.Ive heard there’s been a lot of dog attacks there,with dogs attacking other dogs who are on lead..Very expensive and upsetting situation if it’s not an off lead park.Would just like to know if you knew it was for sure. Hi Mark, It is definitely allowed to walk dogs off-lead on the old golf course currently, even if not officially stated. I walk there almost every day and have never seen or heard of any dogs attacking other dogs in a way that caused concerns. I have certainly never heard of anyone incurring expenses from a dog attack. Most dogs revel in the freedom and play time with other dogs and the social interaction of dogs and walkers is great. Plans to develop the area and install a sports field, cafe, and a playground will change the way areas can be used before too long, though an off lead area is apparently being designated further down the course. 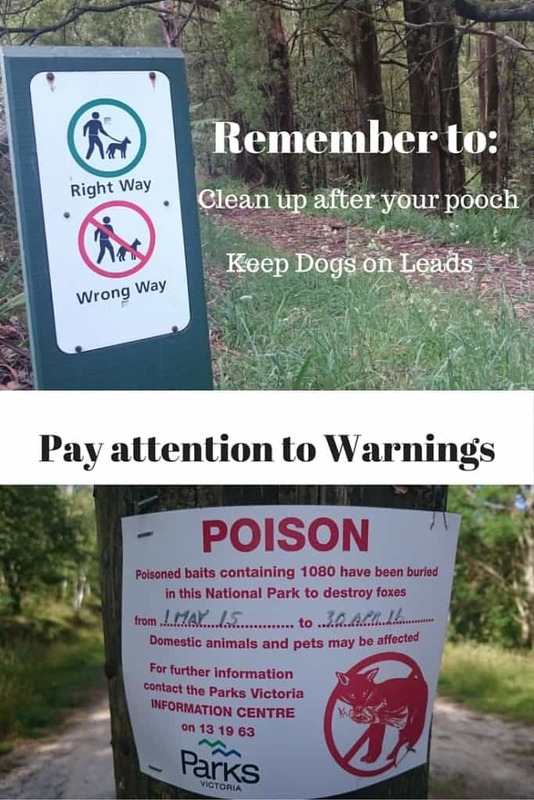 I have looked on the parks Victoria website and it says you only can walk your dogs on the tan track and in the Dandenongs Arboretum. Is that right? Can you walk them anywhere else? Just want some clarification. The places listed on our dog-friendly walks page do allow dogs on leads, including a few of the gardens. The old golf course is an unofficial area that Parks Vic definitely approves of currently, though development plans will mean the area will be defined further at some stage. It is important that they are kept on a lead on tracks. I noticed they have started a road near the Rhodie Gardens side. It will certainly be changing. 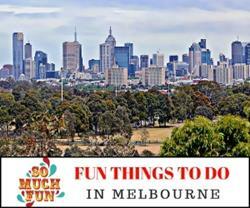 Hi there, we are planning to take our pooch for the first time to the dandenongs for a walk. We were hoping to go off lead at Old Olinda golf course. Is it still permitted or has the changes already started? If so, we will go to Mathias track. Hi, Michelle, you can still go to the old golf course! some work has started on a fence that has rather divided the fairway to the left, by the Rhododendron Gardens. Walk from the old clubhouse, straight down as the views are great. Mathias Track meets at the lowest, left side, corner of the golf course, so you can always do a circuit! It will certainly be changing at the old golf course, though, I think the off-lead area will still be open and not fenced off. It’s quite a large area down below, hopefully, it will not be changed too much. My optimistic views… We often talk to people who used to play golf there and they are sad to see it change too. Hi there I’m just wondering what dog friendly walking tracks you have listed actually allow the dogs off lead..? Hi Josh, All the forest walks require dogs on a lead but the Old Olinda golf course allows dogs to romp and really enjoy themselves. It is the best place of all as the views are stunning and quite a few people go there, so there will almost always be some ‘new friends and besties’ for your dog too. It is on the Olinda-Monbulk Road, just past the recreation oval. I’ve seen no dogs allowed on the fire trail but it doesn’t appear to be a council sign ..
Any idea if someone has just stuck it there or if there is actual law in force able? I did check with Parks Vic and they said no dogs are allowed on that side of the mountain at all. Such a shame as so many people could access it from the suburbs below. Looking for places to walk /hike moderate to hard level with my pooch but also dog on lead only. not off lead ? Many thanks for this guide. It’s very handy for locals, as well as visitors. Walking in the Hills with my Dog, is one of the joys of living. You are most welcome, Marigold. I am happy that the article is proving useful. We are so lucky to have wonderful trails that are dog-friendly. Thanks, Jilly. 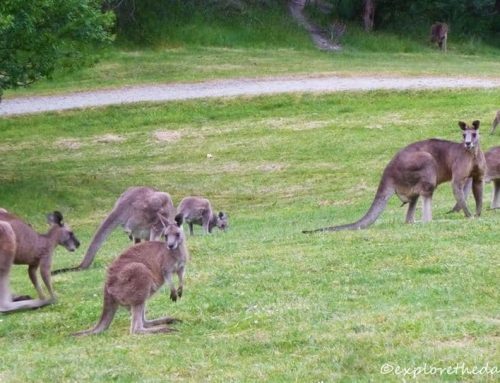 We are so lucky to be able to enjoy the Dandenongs with our fur-babies too. Thank you, Miss Jilly. Glad you have found it handy, it’s amazing how many miles of tracks we can take dogs on! Hi Caroline, Perhaps you could look for dog-friendly places to stay on AirBnB.com as they have a refine option to search for specific needs? As for snow, we get a little up here but not a lot generally… I think you may be able to take them to the lookout area on Mt Donna Buang when there is snow, need to check, though. Hello, I have not seen any signs allowing dog walking on the fire Trail or any of the trails on that side of the mountain. Rather a shame as people living down that side of the mountain would love to have access for walking their dogs. 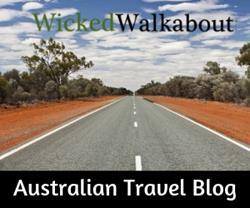 You can go on the Track from Mt Evelyn to Silvan though, it is a great walk. Thank you Jane. We’ll try the track from Mt Evelyn to Silvan. That’s great Viv, let me know how you go. Look at the other dog-friendly tracks on the website too.